Wrestling Obsessed or Way of Life? Should there be only One WWE Champion? Randy Orton, the future Undisputed WWE champion? The age old question has again resurfaced in the present day going into WWE’s pay-per-view event TLC. With both John Cena and Randy Orton winning the WWE World Heavyweight title and WWE championship (respectively) at Hell in a Cell, and successfully retaining their titles at Survivor Series, John Cena has thrown down the challenge, and WWE’s C.O.O. Triple H has booked the match: John Cena vs Randy Orton in a TLC match for both the WWE and WHC championships. Has it ever been done before? We’ve seen a unification ladder match before when the WWE Intercontinental champion Rob Van Dam defeated the WWE European champion Jeff Hardy; thus abandoning the Euro title. But it is the first time that both WWE sanctioned World titles will be up for grabs in a single contest. No disrespect towards “The Ayatollah of Rock ‘n’ Rolla”; while Chris Jericho did become the first-ever Undisputed WWE champion by defeated both The Rock and Steve Austin on the same night, WWE management didn’t consider Y2J as the “face of the company”. This unification match at TLC is meant to determine a true World champion, but most importantly to Triple H, it’s meant to distinguish who is the true face of the WWE. While a large majority of the WWE fans have already pegged John Cena to come in possession of both titles; there’s also a possibility that a) Randy Orton will win both championships, or b) the World titles will get swapped. On Monday Night RAW we saw what Randy Orton would look like if he possessed both the WWE and World Heavyweight championships, but a popular prediction is since a unification match is too “epic” of a concept to be wasted on WWE’s year-end pay-per-view event and should be held off until WrestleMania, the titles will instead be swapped with John Cena once again becoming WWE champion and Randy Orton going back to the World Heavyweight title. Personally, whether Cena or Orton becomes Undisputed champion is not a concern because, honestly, the lack of definition in the brand extensions with the continued existence of two World titles is absurd. There should only be one World champion, one secondary champion, one tag team champions, and one women’s champion. Answer the Question: Will the “epic” TLC match result in an Undisputed WWE champion; or will the championships be swapped? Liked this post? Then share it! And once you’re done letting the millions and millions know of WrestlingTimesX on WordPress, follow WrestlingTimesX across social media! Have a wrestling site? Need a writer? E-mail freelance inquires to WrestlingTimesX@gmail.com – Subject: Write for Us. John Cena and WWE Fans Choose Daniel Bryan! YES! YES! YES! The Barclays Center erupted with John Cena’s decision to select Daniel Bryan as his opponent for SummerSlam. A decision granted to the WWE champion by the new RAW General Manager Brad Maddox. Cena asked the WWE Universe in Brooklyn, NY, who they would like to see get a WWE championship match. Some options were obvious no’s like Fandango, Ryback, and the three guys from 3MB. But some options were surprisingly met with minimal to mixed reactions: Sheamus, Randy Orton, Chris Jericho, and the returning Rob Van Dam. Yet, the clear undisputed odds-on-favorite–as JBL puts it–is the “World’s Toughest Vegan” Daniel Bryan. Considering the rise he’s been on? How strong he has looked in 3-on-1 situations against The Shield? The clean win he had over Randy Orton in the main event of RAW a few weeks ago? The new WWEShop.com exclusive tee? Clearly these are signs that WWE brass are backing Bryan’s push. So it was strange that at Money in the Bank–which wrestling fans were positively certain that Daniel Bryan would walk out of Philadelphia as Mr. Money in the Bank–Bryan didn’t win the WWE championship MITB contract. Bryan didn’t need MITB, his undeniable wave of momentum earned him his shot at the WWE championship. When Cena made his decision the Barclays Center erupted as did Daniel Bryan. In unison, Bryan had the Brooklyn crowd chanting YES! YES! YES! 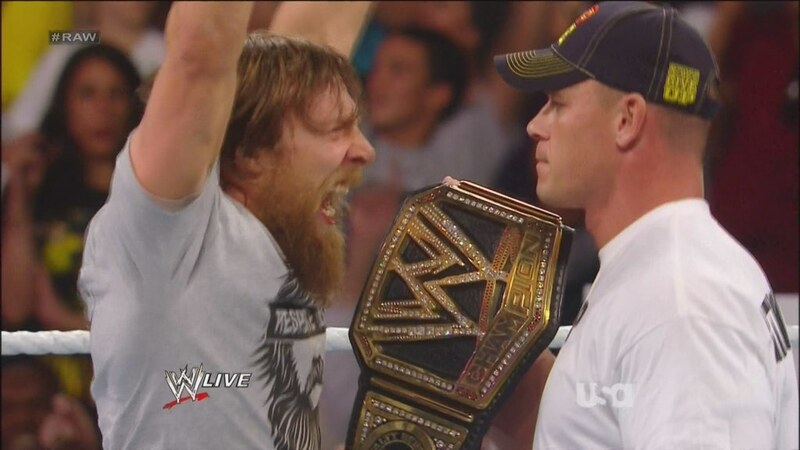 So at SummerSlam, it will be John Cena defending the WWE championship against Daniel Bryan. A match up that–just until recently–only existed in the archives of WWE Velocity. Now the life-long journey starting out in Shawn Michaels’ wrestling academy to training with William Regal, to wrestling around the world honing his craft has all led Bryan to this moment. Answer the Question: Who will walk out SummerSlam as the WWE champion? John Cena? Daniel Bryan? or Mr. Money in the Bank Randy Orton? Have a wrestling site? Need a writer? E-mail freelance inquires to WrestlingTimesX@gmail.com – Subject Line: Write for Us. Enter your email address to follow WrestlingTimesX and receive notifications of new posts by email. Wrestling Podcasts: Wrestlers Turned Podcasters Galore! WWE Reality Programing: The Real Husbands of WWE? Wrestling Championship Edition: What Makes a Great Champion?